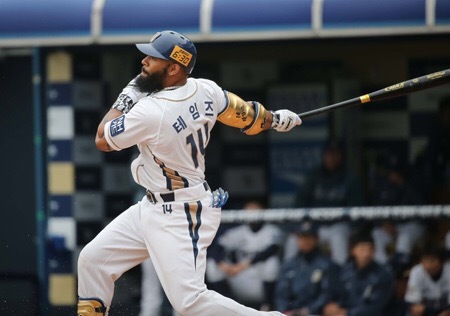 Eric Thames has officially made his return back to the MLB by signing a three-year deal with a club option for a fourth season with the Milwaukee Brewers, according to Adam McCalvy of MLB.com. The deal is worth over $15 mil guaranteed, according to Jerry Crasnick of ESPN.com. Now, Thames saved his baseball career by leaving the MLB for Korea. In Korea, the 30-year-old first baseman produced a ridiculous .348/.450/.720 batting line and belted 124 home runs and 64 stolen bases. Also, he walked 235 times. In addition, he was also the KBO MVP and Gold Glove winner in the 2015 season becoming the first KBO player to hit 40 homers and steal 40 bases in a season, logged a .391/.497/.790 slash line and became the first player in Korean baseball to hit for the cycle twice in the same season. Interestingly, he brings more value than recently designated player in Chris Carter by being able to play the corner outfield spots with ease and being a more disciplined hitter. He can move and field better, plus this makes sense why Carter was released basically, as they pulled the trigger on Thames. ﻿Finally, Thames does have a track record in the MLB, as he has 684 at-bats with a .250/.296/.431 batting line and hitting 21 home runs in 181 MLB games. He has also spent quite a bit of time at Triple-A, racking up a .312/.389/.506 slash and 23 dingers over 870 trips to the plate.